Transport Management marketing is the segment of logistics. It primarily entails getting your product from the source to the place that you need it to be. Transport management is the efficient management of transportation operations to bring down costs and increase delivery reliability. Also, transport management refers to a process that manages every aspect of vehicle maintenance, fuel costing, warehousing, and cargo handling. DSV Daily Pallet is a high-quality, standardized service offering daily pickup and departure with on-time delivery of palletized shipments to any destination in Europe. It offers cargo insurance through its own insurance company to benefit from all-risk insurance, competitive rates, and fast claims handling. The transport management service video shows how DSV road transport services help your goods to arrive at the right place, at the right time. C.H. Robinson’s air consolidation services can help remove days from your supply chain to ensure products hit markets on time and within budget. It provides consistent service, competitive costs and easy to use Navisphere technology to improve your international logistics. The transport management service video shows how C.H Robinson can help you effectively consolidate your freight. IBM corporation aims at delivering reliable transport management services to the citizens to make it fast, safe and trouble free. IBM transportation management center helps monitor traffic signals, vehicle sensors, video cameras, bluetooth sensors and GPS embedded devices. The transport management service video showcases how IBM manages and improves transport management to contribute in smart city developments. SAP transportation management system (TMS) gives the flexibility to accurately forecast demand and shipment volumes to fine-tune transportation planning. It can consolidate orders and maximise the return on transportation spend by customer. The transport management service video shows how you can enhance logistics management and gain real-time visibility into global and domestic shipping across all transportation modes through SAP TMS solutions. Quintiq is a company that develops planning, scheduling and supply chain optimization software. It solves supply chain puzzles using a single supply chain planning & optimization software platform. It provides integrated public transport planning across all your planning horizons. The transport management service video shows how Quintiq keeps the city running smoothly with its world-class public transport planning facility. Exel provides services from a total transportation outsource to find capacity of tough loads needed to move. Its asset-neutral approach allows designing of a transportation solution that leverages multiple modes to ensure that product arrives where it needs to be at the lowest landed cost. The transport management service video shows how Exel helps transform your transportation network into a competitive advantage. Capgemini transportation management is build with Oracle OTM which offers a streamlined and flexible way to implement a reliable transport management system (TMS) which saves companies’ time and money. With the help of their logistics processes and technical workflows, Capgemini’s TMS NOW supports order consolidation, planning, tendering, tracking, freight settlement and reporting for shippers. The transport management service video showcases the overview of Capgemini’s TMS NOW. Dynamic 3PL provides the full range of warehousing and transportation management services, with a focus on cost-effective and value-added solutions. Being specialised in Warehousing, Inventory Management, Transportation Management, Kitting, Display Building and Packaging, it provides the full range of warehousing and transportation management services to meet complex logistics needs of customers. The transport management service video conveys how Dynamic 3PL can be best choice for your logistic solutions. Toll is one of Asia Pacific’s largest freight transport provider that permits shifting of goods by air, road, rail or sea. It has specialised fleet to provide a wide range of heavy haulage and bulk freight services for payloads exceeding normal capacity. The transport management service video shows how Toll provides safe, secure transport services for a wide range of freight types, providing the accredited expertise to handle your specialised cargo. Telefonica provides transport management solutions that make the transportation of goods and people more efficient, safe, sustainable and cost effective by using communications and digital technologies. Their solutions helps track vehicles in real time, reduce operative cost, protect personnel and assets and increase productivity. The transport management service video shows how Telefonica can make transportation process more efficient and effective by using telematics. One For Freight take a holistic approach to freight management by understanding supply chain challenges and fixing them. They identify weak links in the transportation portfolio and use combined experience of their management team which can effectively tackle them. The transport management solution video shows how One for freight can help you make efficient and cost effective freight transportation strategies. Coyote’s Collaborative Transportation Management (CTM) service offers shippers an innovative and comprehensive supply chain solution. The CTM platform is designed to enhance the core transportation services provided by Coyote to shippers, providing complete network visibility as a means to reduce freight spend. The transport management solution video shows how Coyote is fiercely dedicated to delivering unprecedented customer service through its CTM service. TRANSPOREON Group is a prominent transportation management solution provider in industry. It offers SaaS based logistics platforms headed for transportation management, e-sourcing and retail specific dock scheduling. TRANSPOREON’s efficient, user-friendly Web-based solutions facilitate RFP management, load tendering, dock scheduling and real-time mobile tracking and tracing. The transport management solution video describes how TRANSPOREON can optimize your transportation and logistics processes. Amovi develops market-leading mobile video solutions for the global marketplace. It provides fleet operators with important video and data information. Its mobile video solutions smoothly connect to telematics and other vehicle safety systems to provide a complete view of performance. The transport management solution video describes the features and benefits of the Amovi cloud-connected camera system for fleet transportation companies. MTM help its clients accomplish their goals by leveraging high quality customer service. From statewide non-emergency medical transportation (NEMT) brokerage to scheduling and dispatching for major transit agencies, its services aim to improve member health outcomes while aligning with client objectives, reducing program costs and increasing satisfaction. The transport management solution video shows how MTM breaks down barriers to healthcare by assigning the most appropriate mode of travel. 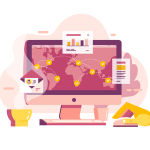 Favendo offer a transport management solution that links existing public information with passenger´s location-based data which optimises customer service and improve marketing success at transportation facilities. They provide real time data about the number of visitors, visitor flow, and length of stay helps gain insights into visitor´s behavior and preferences. The transport management solution video shows how Favendo offers reliable public transport services to their customers. STOCKCARGO provides BreakBulk Carrier, Experts Heavy Lift Project Cargo, Intermodal and Barging transport services. They offer door-to-door transport services from anywhere to any location in the world, in the most cost-effective rates. The transport management solution video details the various transport services offered by STOCKCARGO. SEEMO offer sustainable, efficient and electric mobility and has the potential to revolutionize passenger transportation in urban areas. SEEMO is a public transportation service which combines the advantages of private vehicles, conventional public transportation systems and modern technologies like electric and autonomous vehicles. The transport management solution video Introduces SEEMO as an environmentally friendly, efficient and economical public transportation service. Waller specialises in a full range of road haulage, offering a complete service for long and short distances, all at competitive rates. It comprises of dedicated teams who are always on hand to helps arrange a service to meet user’s needs.The transport management solution video shows how Waller provides a simple and hassle free haulage service at a relatively low cost. Priority Freight offers a secure cloud-based Transportation management System delivering total visibility to clients. Its intelligent transport optimisation supports the client’s objectives and enhances their profitability, whilst reducing carbon footprint. The transport management solution video shows why Priority Freight is the expedited transport and logistics provider of choice for the aerospace industry. With the above transport management services and solutions video marketing examples, it’s evident that companies are fast integrating videos in their marketing campaigns and various other touchpoints. If you are planning to develop these videos, a good start is to develop a brief of what can be the tone and style for your videos. We advise you to be different and unique while you create your messaging through the videos.